Karen Pokras Toz is a writer, wife, and mom. Karen grew up in the small town of Orange, Connecticut and graduated from Ithaca College with a degree in Finance. She also attended the University of Richmond, where she studied law and business, receiving both a JD and an MBA. Karen is a member of The Society of Children’s Book Writers and Illustrators. Karen lives in Montgomery County, PA with her husband and three children. Nate Rockledge is a ten year old boy dealing with fourth grade, he isn't into girls or sports, instead he likes to draw in his sketch book and he is pretty good at it! While he is drawing his imagination takes him on fantastic adventures where he is always saving the world, but when something happens and he really needs to save the day can he do it? I loved Nate, his character is so relate-able, the relationship that he has with his sister seems very typical, and the way he describes his mother's cooking often had me laughing out loud, but I found it touching that he was determined not to hurt his mom's feelings so he kept his thoughts about her cooking to himself.My favorite parts of the story were the adventures that Nate's imagination takes us on, the author writes them in such a smooth, detailed way that I could just imagine them actually happening. The way this story was written it actually felt like I was seeing things thru the eyes of a ten year old. From the ordeals that he has with Lisa Crane, to the spats he has with his sister, or spending the evening at his best friend Tommy's house, each scene comes to life and seems so realistic. I loved the positive relationship that Nate has with his parents. While I think the cover art on this book will capture the eye of a young boy, but the story inside will certainly capture their imaginations.As an older person I found myself thoroughly enjoying the story, it sort of reminded me of the books I read when I was a kid. I think Nate and his adventures would make a great television or cartoon series. A great book that I wouldn't hesitate to recommend to anyone. On a scale of one to five I would give this book a six because it's just that good. After reviewing dozens of books geared towards 8-10 year old boys, I have to say that Nate Rocks the World rates high in enjoyability for this age group. It is hard to find a well-written boys' book that will keep their attention, but Karen Toz does a wonderful job in this by using cartoons and illustrations to which an 8-10 year old can relate. This book follows Nate as he deals with the ups and downs (mainly downs, to him) of being a 10 year old. His mom serves him leftovers, his dad is living in the past, and don't get him started on his bossy older sister! It seems like everyone is out to get him and that nothing in his life will go his way. Nate uses his imagination to combat these feelings, and through his cartoon drawings, he begins to see things in a different light. The ending of the book is heartfelt and teaches young boys that dreams and goals can come true. This is a wonderful page-turner, that will keep your young man engaged during the entire reading. Who knows, it might become one of his favorite books to read! In Nate Rocks The World, we meet none other than Nathan Rockledge, aka Nate Rocks, a ten year old boy with a delightful imagination. He’s always the last kid chosen for sports but in his imagination he’s a major league play and he can hear the crowd around him screaming, “Nate, Nate, Nate, Nate,” unfortunately it is usually his mother calling him to dinner. By the way she is a terrible cook and not very good at sewing either. Nate’s dreams take him out west along with his spurs, to the White House where the President depends on Nate to find the spy, and into space where once again comes to the rescue of the world. Nate has a pesky, bossy, mean big sister. She loves to pick on him. His father likes to tell the same stories over and over and acts like it is the first times he’s ever told it. Nate and his best friend Tommy are trying to find really cool costumes for Halloween. When they all head to Florida for winter vacation things start to go wrong but just maybe Nate can save the day. 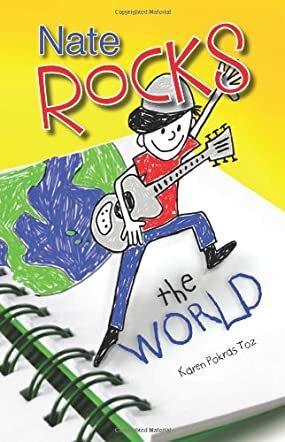 Nate Rocks The World by Karen Pokras Toz brings us a tale that will please girls, boys and adults. The target audience is boys 9-12 however; I think much broader audience will enjoy this book. This book is right up there with “Middle School: Worst Years of My Life” and “Diary of a Wimpy Kid.” I very much enjoyed both books but think both authors better keep an eye on MS Toz, she is their competition. The characters are sure to delight all readers. Readers will find to plot easy to relate too. I just ordered copies for my grandsons. Please MS Toz more Nate! Nate Rocks the World is a quirky, laugh out loud, feel good book written by Karen Pokras Toz. Nate Rockledge is an ordinary ten year old boy who dislikes sports, is irritated by his tormenting older sister and is frustrated by his over-meddling parents. He is like any other pre-teen boy except, he has something the other kids do not have. He has a unique and rare creative outlet which allows him to be a Super Hero or a World Series Champion on a whim! Life for a fourth grade boy is tough enough, but classmate Lisa Crane, likes to push Nate's buttons on a daily basis. When life's challenges get tough, Nate is able to escape into a different world with his imagination, daydreams and drawings. Through his alter ego, 'Nate Rocks', he can conquer the world with Captain Asteroid and defeat villains such as the Evil Doctor Shadow. When he becomes Nate Rocks, he can do anything and face all of his fears, but will Nate be able to do the same in real life situations? Karen Pokras Toz truly writes a masterpiece on paper with Nate Rocks. The cover of the book is captivating and catches the interest of the reader immediately. Each chapter flows smoothly and the plot is solid. Children, ages 9-14 will be able to relate to this book the best, but not limited to this age group. This book is perfect for any grade school child, whether it is boys or girls because they can relate to the difficulties and frustrations of life at that age. Children will also be able to escape their own reality right alongside with Nate. Society today seems to push children to be competitive, to be in sports, to excel at everything they do, when in fact, children just want to be children. They want to play super heroes, daydream and be allowed to have an imagination. This book encourages the magic that is missing from our children's lives and inspires children to follow their dreams. This book is one that children will definitely want to read and not put down. Karen Pokras Toz hits "Nate Rocks" right out of the ballpark!